Apparently it’s simple. 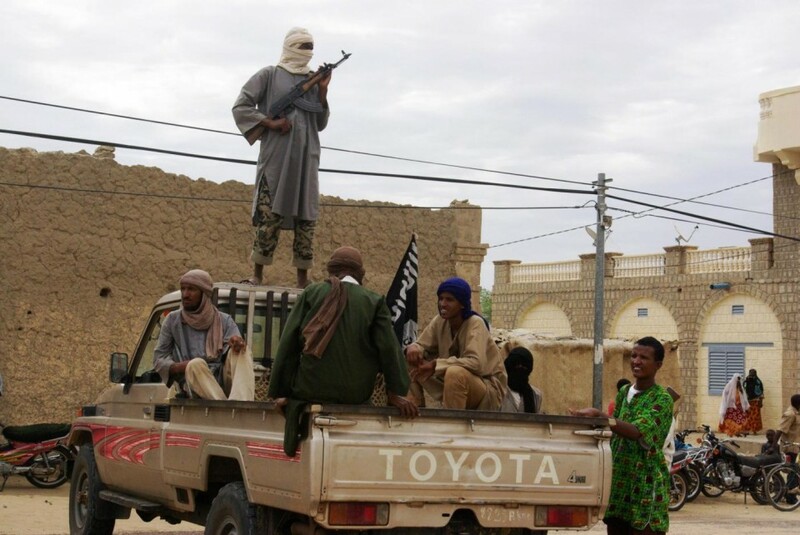 Almost simultaneously with the various sudden changes of government in Mali from March 2012 up until today, Islamic terrorist groups and the Tuareg secessionists have created an extremely tense situation. At present in the south the confused goings-on of the national bourgeoisie have led to Django Sissoko being favoured by the military as the head of government in Mali. This is after his predecessor, Cheick Modibo Diarra, was arrested and forced into "voluntary" exile in Sudan. Some ministries, including defence, were handed over to associates of Captain Amadou Sanogo, who was responsible for the coup against Diarra last March. Thus the president of the republic himself, Traoré, takes orders from a captain in the army who at the moment seems to be the strong man of the regime, supported by the United Nations, the U.S. and France. In the north, things are just as confused. The international crisis, the drought of recent years, the return of Tuareg fighters (who fought as mercenaries in the pay of Ghaddafi during the Libyan civil war and who have come back with their arms to revive their Sahelian nationalism), yet another food crisis: all have combined to afflict this area with hurricane force. Moreover, the increase in drug trafficking (60% of the cocaine that arrives in Europe passes through these areas), the lucrative arms trade in arms and desperate migrants have transformed the north of Mali and the entire Sahel into a sort of Eldorado of criminality. As if that were not enough there is also the mass presence of radical Islamist military groups, jihadists, and Al Qaedists and other terrorist-inspired groups, such as AQIM (Al-Qaeda in the Islamic Maghreb), Mujao (Movement for the Oneness of Islam in West Africa) and Ansar al Din (Tuareg separatist group — inspired by Salafi-jihadism) who exist from these various activities, including the abduction of several Westerners. Every one of these factors has made the north of Mali an ungovernable zone with all the predictable consequences. The deceptive simplicity of the problem stems from the fact that France, like all the other international bodies, considered the situation in northern Mali abnormal, dangerous, and a melting pot of political terrorists, criminals and kidnappers. Thus, in the name of the "legitimate" government (even one born out of a military coup) and in accordance with the principles of the ever-useful "holy" war against Islamist terrorism, it has intervened militarily without much hesitation. While Algeria has given its unconditional political support and the consent to the use of its airspace, France is responsible for doing "the dirty work". After the first aerial bombardments it has put 1,500 soldiers on the ground with an eye to bringing that number up to 3,000 within a few days. The categorical imperative is to rid the field of dangerous terrorism and return Mali, along with the whole of the Sahel, to democracy and peaceful coexistence. As usual, nothing could be more mistaken. The ten-year records of Franco-Algerian intelligence have now revealed that the Algerian secret service (DIS), in collaboration with the French and Americans, first of all infiltrated and then controlled the main terrorist organisations and bought off most of their leading figures. Members of AQIM, such as Abu Zayd and Yahya Gawadi and Mokhtar Belmokhtar, are believed to be close collaborators with the Algerian DIS. Even the head of Ansar al Din, Iyyad Ag Gali, and Sultan Wuld Badi, head of Mujao (recently formed organisations inspired by Al Qaeda’s Islamic jihadism and Salafism) are suspected of being in the pay of Algerian Intelligence. As for Gali, his collaboration dates back to the eighties when he worked for an Algerian state agency in Tamarrasett. Leader of the 1990 Tuareg revolt in northern Mali, he facilitated the division between the rebel forces which brought a compromise peace with the government that neutralised the secessionist wave. In May 2006 he cooperated as usual with the DIS to undermine the Tuareg revolt of Kidal, again in northern Mali. Algerian Intelligence records reveal his role in a couple of terrorist attacks where he collaborated with US Intelligence in order to reinforce the image of AQIM. Since 2009 we find him inside AQIM itself, this time with direct responsibility for the lucrative drug trade and kidnapping of Western hostages, as well as a top rank political leader. The same goes for Sultan Badi. Currently head of the Mujao, in 2009 he was arrested in Mali with other characters of the Polisario Front (national liberation movement of Western Sahara) for drug trafficking. To obtain his release Badi threatened the Bamako government he would reveal the relations between the Algerian secret service and AQIM itself. The threat was effective. In a political initiative taken by Merkel, Bouteflika, President of Algeria, was obliged to hurriedly send a delegate — General Rashid La Alali (not by accident responsible for security with the DIS) — to Mali to resolve the delicate question of the embarrassing links between AQIM, the Algerian government and that of Bamako concerning both the use of terrorism and the involvement of the Mali government itself in drug trafficking. The result was the immediate release of Badi who, presumably, has continued to have links with the DIS right up to recent events. This intermingling between the intelligence services and a terrorism it should be fighting is not new and appears in every political latitude. In this particular case the Bouteflika Government has some interest in establishing “anomalous” relations with the jihadists for two reasons. The first is that infiltrating them is a more successful way to control them, even to the point of commanding their activity, as they have done in some cases. The second is that keeping the terrorist bogeyman in existence allows them to tap the USA and France for arms and finance even at the cost of facing attacks on their oil infrastructure when the relationship with the above mentioned formations gets out of hand. In their turn the governments in Washington and Paris are playing the terrorism-anti-terrorism game to cover their imperialist ambitions. Even if it is not obvious in the Sahel, the USA does not really act just to gain from the eventual exploitation of the primary products of the area, but to put obstacles in the way of Chinese penetration. Beijing’s commercial and financial imperialism now extends to the four corners of the globe. It is strongly involved in any area where the exploitation of gas and oil fields represents even minimal interest, and the Sahel, though relatively small, has considerable resources. It is this reduction of the economic and political spaces of all the other imperialisms, not least the American, which explains why Secretary of State Hilary Clinton expresses herself in such bellicose terms, as in the recent episode of the attacks on the oil installation in Algeria where so many Western citizens were hostages. With even stronger motives, the same kind of talk was used by the French imperialism of “socialist” President Hollande. France has been thinking about a military intervention for some time. In October 2012, only six months after the Sanogo coup and shortly after the Tuareg secession in the north, the French Defence Minister Jean Yves Le Drian declared that a French military commitment was now on the agenda. Obviously the declared aim was the danger of Islamic terrorism and the social catastrophe which it had been able to inflict from Mauretania to the Sudan, with offshoots in Niger and Nigeria. Alongside these pronouncements from political and military leaders have come a series of drones, made available by the withdrawal from Afghanistan, and seen lately over northern Mali. In the view of Paris the Mali campaign can guarantee even bigger success. In the first place it is justification for the exploitation of the gold mines in Mali itself which make it the third biggest producer on the African continent. A secondary gain would be the opportunity to establish good relations with Niger which is the second largest producer of uranium in the world. This would allow the French firm Areva to have a sort of monopoly in providing a primary product of extraordinary strategic importance for both civilian and military purposes. Third, Total Fina, already present in Nigeria, could consolidate its role as an oil major in planning to drill two wells on the borders of Mauritania. In conclusion, we can say that the world crisis which is still producing devastating effects and is preventing even a slow recovery of the real economy, is inciting the ever-greedy imperialists to mobilise, including using force, to scramble for the crumbs of what remains available of the world’s energy and strategic primary resources. That this involves maintaining relations and colluding with terrorism, even up to making a hidden alliance with it only to strike it down at the opportune moment as a declared enemy, is not new. As we have seen recently imperialism, under any flag, disguises the pursuit of its real interests as the just fight for democracy. That the losers are always the usual suspects is equally obvious. What’s new, if you can call it that, is the vicious circle of capitalism's crisis which has ended up giving these instrumental justifications weight so that the use of violence is now "routine" or "normal". All the insiders know the old story, but need to repeat it every time for others to be taken in. The smokescreen always has to work. The longer it works and the more the dispossessed behave themselves, the more the international proletariat plays the capitalist game, the easier it is for an imperialism, made ​​angrier and hungry for any prey, to pursue its interests. Telling things as they really are may not be a big blow against imperialism, against capitalism and its absolute need to survive, but it might help to awaken some proletarian consciousness that bourgeois ideology has long forced to stay asleep.